Another in the powerhouse stable of trainer extraordinaire Todd Pletcher, Archwarrior broke onto the scene in the summer and fall of 2012. 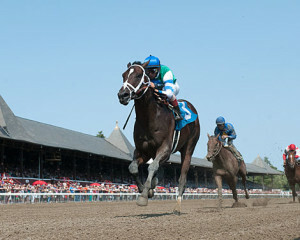 He won in his debut at Saratoga last August in the $80,000 Maiden Special Weight run at six furlongs, and did so in impressive fashion, earning rave reviews from both Pletcher and Hall-of-Fame jockey John Velasquez. Pletcher noted that his colt had gotten a lot of pre-hype race based on his pedigree and how well he’d run in training, so there were major expectations heading into Saratoga. Pletcher’s right-hand man, Velasquez, said Archwarrior had no problem meeting them. Unfortunately for Pletcher and Velasquez, things didn’t go as well in Archwarrior’s sophomore run. Lining up at the $400,000 Foxwoods Champagne Stakes for 2-year-olds in October, Archwarrior showed some of the nerves and inexperience one would expect from a second-time starter. He also struggled with a far superior field – one that included current Derby favorite Shanghai Bobby – than he saw at Saratoga in August. Archwarrior finished fourth in the field, and Pletcher was both disappointed but realistic following the race. The problem facing Archwarrior as we head into the final month of prep races is his health. The colt has been sidelined with an unannounced injury and has failed to run once in 2013, which has raised more than a few eyebrows within the industry. Will Archwarrior be able to return in time to gain the requisite points for the 2013 Derby? Well, that remains to be seen. There are still a number of 100-point races he can run, but with this long a layoff and competition for spots heating up, Pletcher could be putting his horse in a pretty pressure-packed situation. Given what happened at Foxwoods in October, it’s fair to suggest that this isn’t a horse ready to deal with difficult circumstances – but if any two people are capable of coaxing that kind of performance out of a colt, those people are Pletcher and Velasquez.